Renmatix using only pressurized hot water turns wood, agricultural stover, grasses, other hemicellulose and cellulose rich crops and perhaps separated household and business waste into the sugars used to make vehicle fuels and other useful chemicals by treating the materials with compressed water heated to very high temperatures. The idea is to achieve the sugar extraction processing at a cost and speed that sent several companies in recent years racing to find solutions. Even with big government inducements to commercialize a technology for making use of cellulosic biomass, or wood chips, or switchgrass and the other nonedible parts of crops – true commercial scale has eluded everyone. Renmatix’s demonstration facility in Kennesaw, Georgia, is scaled to run its process to convert three dry tons of woody biomass to sugars daily. It’s working. 365 x 3 x 2000 gets to 1095 tons and 2,190,000 pounds annually. Here’s the really short course. The goal is to get to useable and valuable chemicals like transport fuels and industrial chemicals. The raw materials in the field are carbon, hydrogen and oxygen. In liquid form that would be the alcohol molecules like methanol, ethanol, butanol. In solid form or in a solution that life can use it would be sugars. Both sugars and alcohols are carbon based hydrogen rich and have a bit of oxygen along. For human use other than making sweetness with sucrose sugar, the best route to fuel and chemicals is to convert the sugars to alcohols and then on up to more complex molecules for other uses. There is lots of sugar to be had from plants. Sugar from sugarcane or sugar beets can be simply squeezed out. The starch in corn is a bit more trouble to convert back into sugar. The sugar used by plants to make hemicellulose and cellulose is even more difficult to extract. Added all together there’s a huge supply of carbon-hydrogen-oxygen molecules to be used over and over again. But this all starts with sugar. Even the fossil fuels of oil, natural gas and coal have origins in the sugars of living things millions of years ago. Thus is seems apparent that mastering the extraction of sugars that can be processed by fuel and chemical makers very cheaply is an “oil well or gold mine’ for the coming decades. Renmatix Plantrose Process Block Diagram of Video. Click the Renmatix Technology link below to see the flash video of how the Plantrose process works. Click image for the largest view. The really short course on the Renmatix technology is plant material is chopped and ground and mixed with water to a slurry texture. Next the slurry is fed into what Renmatix is calling a ”fractionation reactor”. In the fractionation reactor the hemicellulose breaks into a sugar of five carbon atoms with the attendant hydrogen and oxygen. Next the sugar is separated out leaving cellulose and lignin for forwarding to hydrolysis. At hydrolysis more water is added and more heat is applied for a cellulose reactor. 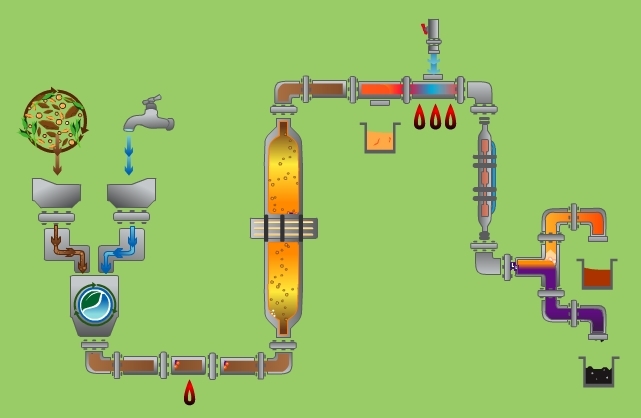 In the cellulose reactor the heat is more intense and a six-carbon atom sugar is broken out. What’s left is the lignin without sugar. Renmatix calls this the Plantrose™ Process – using water in its supercritical state to create cellulosic-based sugar. While this short course gets an understanding covered the Renmatix website linked in the previous sentence covers the process in more detail. Yet the fine details and the answers to most any question are not there as the information is truly intellectual property. Of greatest interest is the relationship between the dry matter coming in and the sugar coming out. Like most websites the Renmatix site casually moves from dry input to refined output without establishing the ratio. Taking in so much dry biomass is one thing – producing “100,000 tons of sugar from a facility each year is quite another. So zeroing on the scale and economic feasibility is still out of reach. Renmatix is the leader for now and the numbers and the people behind the technology are not to be dismissed. Renmatix will very likely get to commercial scale. Just where the demand for the products takes them is the major question. Will it be fuels or chemicals? Having spent years working at OSB mills in NC, Michigan and WV – I can imagine this process as a natural bi-product of those facilities. Currently, those mills strip off he bark, grind it and sell it as mulch. If that bark could instead be turned into valuable sugars instead – I could expect rapid adoption of this process. In the South – because of the long growing season and the abundance of quick growing pines – Trees have become a crop. This is most obvious with 12 year old Christmas Trees. However, our OSB Mill in Elkin, NC used pines that averaged 13 – 15 years in age. In Michigan – the mills use Aspen which is a naturally regenerating species that is not a good sawmill wood. So, for the wood product industry – this wood to sugars process could turn low value waste into a high value revenue stream.